There is an old Sinhala wise saw which, roughly translated, says the departing devil delights in breaking the pots and pans. One is loathe to label David Cameron, who resigned recently as Prime Minister following his defeat at the recent referendum to determine whether or not Britain should remain in the European Union, Satan-lite in an expensive business suit. But the apothegm is not entirely inapposite as some read devilish intent into his departing gesture in nominating almost 50 persons for “gongs”- as the British like to call them – in his resignation honours list in which the exiting premier names individuals for various titles and honours. The leaked list published by the London Sunday Times last week includes aides, allies, donors who contributed to the losing “remain” campaign in the referendum and others who had served Cameron during his premiership. Hardly had the news hit the streets when accusations of “cronyism”, “pay- back time” for services rendered and less euphemistic epithets quickly followed engulfing an already fractious and, at times, confusing political debate in which the Labour Party is passing through divisive internal strife and the Conservatives are not entirely free of inner-party troubles despite quickly settling the leadership issue. It is true that convention allows departing prime ministers the right to nominate persons for honours, be they peerages or knighthoods or lesser categories. Tony Blair did not do so before he left for very good reasons. He and the Labour Party were involved in what came to be called the “cash-for-honours” scandal where persons who gave funds to the party secretly before the 2005 elections were later named for honours. So Blair already embroiled in controversy not the least of which was his dragging Britain into the disastrous invasion of Iraq as a gesture of camaraderie with his transatlantic friend George Bush jnr, did not wish to name names and add to his pitiful legacy. Blair’s successor Gordon Brown, hoping perhaps not to burn his fingers by making use of this traditional opportunity, also desisted from doling out resignation honours. But the row that erupted last week concerned the manner in which Cameron intended to disburse honours and the individuals named in the list which has now become public. While he did the honourable thing by resigning after the referendum defeat he performed a dishonourable act as one of his last in office by naming friends and staff-several of them civil servants working in his Downing Street office – for honours. Had they made significant and definable contributions to the country or for the public good which is what the honours system was intended for, as someone pointed out, there would hardly have been a debate. But Cameron’s last act seemed an obvious exploitation of a tradition that was twisted beyond belief to benefit the clique round the departing premier. It would indeed be a brave leader who would legitimize and defend the decision to extend national honours to his chauffeur, an aide to his wife Samantha who also doubled up as a stylist and adviser on dress, and an aide next door at No 11 who, among other things, persuaded Chancellor George Osborne to change his hair style. Style might maketh a man (and woman) but should they make the honours list, is what enraged opposition parties and the public demanded to know while calling for a radical change to an archaic system. It also seemed a defiant gesture as some named are serving in the new Theresa May government thus involving the new Prime Minister who has refused to block the names on the list or tamper with it less this creates a bad precedent though she has the right to do so before it reaches the Queen. There are other safeguards including a Whitehall committee that vets the list of names before it is sent to the Prime Minister. It is known that at least one Conservative Party donor had been blocked by Whitehall after Cameron attempted to get him into the House of Lords. Sri Lankans who have read about the rather farcical goings on would of course not be surprised at the idiosyncrasies of politicians and their readiness to exploit national institutions and traditions to feather their own nests or those of their cronies. Fortunately Sri Lanka does not have a similar honours system though it does confer national honours on a wide category of persons who have performed public service be it in the security forces or in the arts and cultural fields. Had Sri Lanka such a convention where the President or Prime Minister could dispense honours there would be tens of thousands of our countrymen and women who have done little else than pay obeisance to politicians walking around with three-letter prefixes or suffixes to their names like Britons who have become Sir Ali Thakkadiya or Pal Hora OBE. While honours should be for those who do something exceptional and not performing tasks in their everyday jobs or donating money to political parties, however that money has been made, Cameron did not seem to mind what the Britons would think of him now that he has quit. But in Sri Lanka it is not the departing devil that smashes the pots. Those who assume office seem to do so from the very beginning. Consider for instance the National List system which this “good governance” administration has brought into even greater disrepute by appointing to parliament individuals rejected by the people at elections. This is not only a slap to the face of democracy and the right of the citizens to proper representation but to corrupt the system. The corruption starts when the honours system or the national list provision in Sri Lanka clashes with democratic principles. The most obvious way in which democratic principles are undermined is when those who have not been elected- like those elevated to the House of Lords or enter parliament through the national list as in Sri Lanka – make laws we must live under. 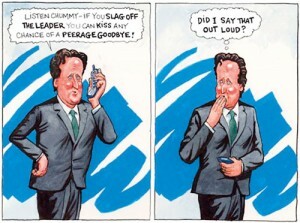 It might be recalled that when Cameron emerged as the Conservative Party leader some 10 years or so ago he began by saying that he wanted to clean up politics. But as Prime Minister he had surrounded himself, in cabinet and outside, with friends and contemporaries from the famous public school he attended – Eton – and from the Oxbridge universities so much so that it represented the worst of the “old boys” network. Throw your mind back to more recent times in Sri Lanka, in fact to the last 19 months or so. Remember the promises made to the people by Maithripala Sirisena, the common opposition candidate who, like Cameron pledged to create a new political culture that would cleanse the country of nepotism, cronyism, and corruption. Openness, accountability and impartiality were to be the watchwords of a good governance administration. Meritocracy would replace cliquism. These were promises made from the end of 2014 when the country headed for a presidential election and later parliamentary polls. But those who promised to eschew nepotism broke that pledge no sooner they sat in the seats of power. A presidential sibling went from being general manager of the Timber Corporation to head the Telecommunications Regulatory Authority later claiming a huge salary and perks. On the other side of the political coin, the UNP that was the other major partner in the national unity government reverted to what it does best – create a “chumocracy” under which the plum jobs were filled – and are still being filled -from the old school network irrespective of whether those selected can do the job or not. So much so that in Colombo society a standing joke is that if you do not have an FRCS against your name you could say goodbye to a job at State expense and also say goodbye to meritocracy. As is now known in today’s Sri Lanka, FRCS has nothing to do with being a Fellow of the Royal College of Surgeons. But being from another Royal College – one could hardly call it another Eton – would indeed be helpful in clearing a career path however temporary that might be. Given the fact that the Conservative Party that Cameron once led and the UNP belong to the same international ‘club’, it is not at all surprising that this kind of cliquism should determine their version of clean politics. “It is cronyism pure and simple and proof the Tories will put self-interest before country”, said the Labour Party’s deputy leader Tom Watson as the news about the Cameron honours list broke. Sri Lanka might not have such a system of paying debts of one kind or the other. But Sri Lankan ingenuity has devised other means of extending corruption and abuse. One is the tender system which despite all the verbiage about openness and accountability could still be manipulated to benefit one’s friends and political donors at the expense of the country. Family and relatives of politicians open companies to which state institutions siphon funds so that they accumulate enough wealth for several samsaras. Why should Sri Lanka have peerages and knighthoods though one knows of Sri Lankans who have made desperate attempts to earn themselves an honour or two? We do not need knighthoods. We have tenderhoods, ethanolhoods, cocainhoods and some other hoods that better be left unsaid. If nothing else at least one can appoint a few consultants and plant them here and there. So shines a good deed in a naughty world, as the Bard said.